The last few years has seen a significant growth of new mattress companies. The industry landscape has changed dramatically with the emergence of online bedding companies; most of which have pushed hard to capture the under $1,000 market. There are however, a few bold manufacturers who set out to produce high quality product at affordable prices that bridge the gap between budget and value. Avocado Green Mattress is one such Manufacturer. However, they never loose sight of their environmental responsibility. You can also sense the genuine pride they take in doing so! The first thing you'll notice about the Avocado Green Mattress is its Cover. The Button-Tufted design has a soft hand and classic appearance. Hand tufting the yarn secures each layer of the mattress without glues. The result is aesthetically pleasing as well as functional. Securing the layers without using glues makes for a more responsive feel. Bedding manufacturers use glues and adhesives that create a trampoline effect. Hand tufting also limits the appearance of irregularities in the surface of the bed. No dangerous chemical adhesives are used. 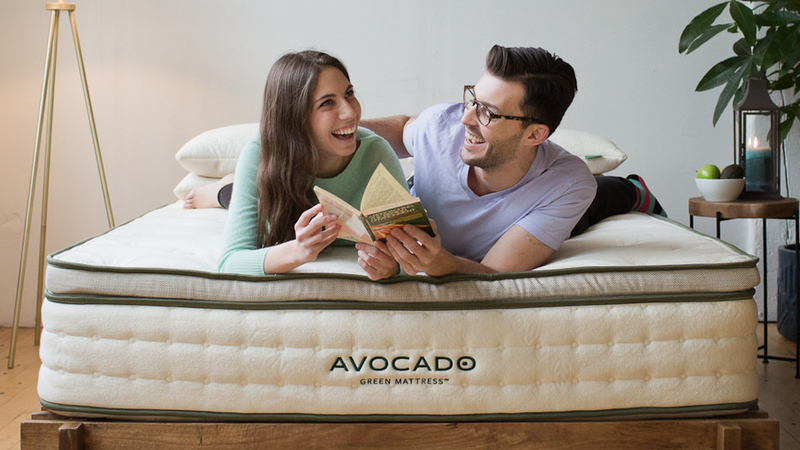 this makes Avocado Mattress is a safe sleeping environment. The ticking is certified to meet Global Organic Textile Standards (GOTS). 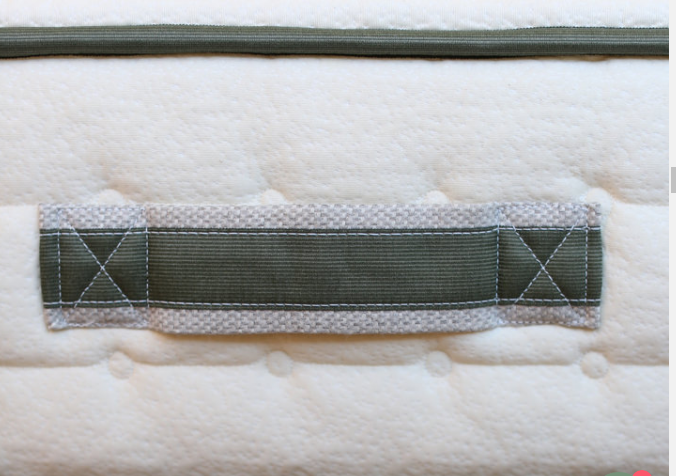 Avocado Green mattress uses an 8” individually pocketed Leggett & Platt innerspring system. This type of structure provides great support and superior spinal alignment. Because the coils are allowed to float independently, better body contouring occurs. Couples will appreciate the great motion isolation. This limits disturbance from sleep partner activity. Keeping with the company's environmental platform, only recycled coils are used. The innerspring is divided into three distinct comfort zones. 14lb. Gauge coils at the head and feet and 17lb. In the center. The middle coils are lighter but more condensed. This allows for greater conformity and pressure relief. The outside perimeter of the mattress consists of a 16lb. border coil. This offers solid edge support while creating a full edge to edge comfort feel. It also prevents the sensation of rolling off the bed. These features are more commonly found in high priced luxury mattresses. Avocado’s innerspring system is designed for both comfort and durability. The Zoned coils also provide the proper amount of support for shoulders and hips. Like many solid innerspring mattresses, over 200 lb. body types will experience a bit softer comfort feel than lighter weight individuals. Take this into account when selecting firm or pillow top options. Natural Dunlop latex is pressure relieving and provides great conformity. Dunlop latex uses less chemical processing than Talalay. It is also thought to be more durable. Avocado mattress is certified by the eco-Institute of Germany. The institute declares this bed to be free of volatile organic compounds (VOC’s ). This means no formaldehyde or pesticides are present. Natural Dulop Latex ​is very buoyant and creates a floating sensation. That is a distinct difference from Memory Foam. Mattresses like Tempur-Pedic or Serta iComfort have a totally different feel. You sleep in them, not on them. Because memory foam responds to body heat, it tends to sleep on the hot side. Natural Latex does not retain heat and sleeps significantly cooler. Of course, Memory Foam is made from petroleum products, Natural Latex is produced from the sap of the rubber tree. It provides the most non toxic, natural sleep surface available. What used to be considered a standard feature on all mattresses has become a bit of a rarity these days. To save money, most companies no longer have any handles at all. The purpose is to be able to adjust your mattress and more easily change sheets and mattress pads. We would not recommend carrying your mattress by these handles. Although we have not put it to the test, even the heaviest handles are not meant for that kind of stress. Since 2007, all mattresses must meet strict federal standards for fire retardancy. Most use potentially toxic chemical barriers to meet theses tough but necessary regulations. Avocado Natural Green Latex uses 100% natural hydrated Silica instead. Both sides are treated for full protection. The addition of 100% Natural Joma Wool creates a natural fire barrier. This again is a much more environmentally friendly approach to safety! 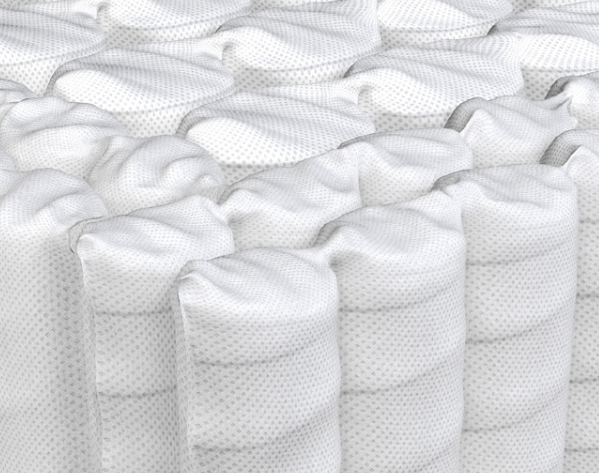 Standard: The Standard is an 11" Gentle Firm mattress that is ideal for back and stomach sleepers. It offers great support and alignment with just enough conformity to relieve pressure points. Optional Pillow Top: The Pillow top adds an additional 2" of Natural Latex (5" total) to the surface of the bed. This creates a Luxury Plush feel that is perfect for side sleepers who require more conformity for the shoulders and hips. ​Shipping is free to your door step in the 48 contiguous United States. $99 for in home set up. 25 YEAR LIMITED WARRANTY. 10 year full non-prorated warranty, Remaining 15 years limited prorated warranty. Give your Avocado Green Mattress 100 nights to convince you it's the best sleep you've ever had. Be sure to give adequate time during your trial for your body to adjust to your new bed. 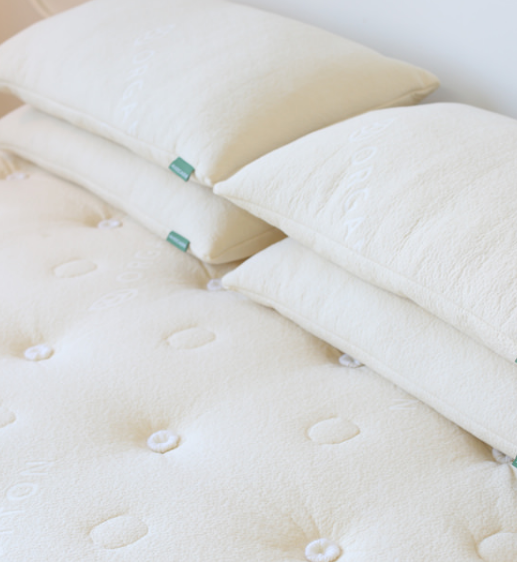 A new mattress often requires a brief break in period. If for whatever reason you ultimately decide Green Mattress does not meet your expectations, send it back for full credit. Just contact Avocado's service department to arrange a pick up. Your mattress will either recycled or donated depending on regional requirements. No returned beds are ever resold. Exclusions: If you take advantage of finance terms, any applicable interest will be subtracted from your refund. Only one sleep trial will be granted per household. Avocado has successfully introduced a mattress that will make both entry level and high end shoppers take notice. The Avocado Green Mattress features 100% natural latex rubber, pure JOMO New Zealand Wool, certified Organic Cotton, and support coils manufactured from recycled steel. No chemical or adhesives are used and JOMA Wool acts as natural fire retardant. These days, there is a huge consumer interest in being environmentally responsible. Avocado recognizes that for every company that aspires to live up to that standard, there are far more taking great liberties with the words “Green” and “natural”. Some companies refer to their products as natural latex when in fact, only a small percentage of the product is actually natural rubber while the rest is petroleum based synthetics. Avocado has proven that going green can in fact make your body, mind and wallet feel great about your purchase! Natural latex provides just the right amount of buoyancy and pressure relief while the pocketed coiled system adds additional support and comfort. We were aware of Avocado's sincere efforts to support a greener environment. The real surprise was the amount of quality that has been built in for the price. Consider us impressed! ​Avocado Green Mattress has earned a 4.5 out of 5 star rating from BestSlumber.com in our under $2,000 category!